With a recent survey showing one-in-six Americans now owns a smart speaker, Apple would have been pained that it missed its planned holiday launch of its Siri-powered HomePod smart speaker. First unveiled in June, the HomePod was already late to make an appearance with the Alexa-powered Amazon Echo hitting the market in late 2014. Although no reason was given for the delay, that Apple doesn't seem to have had any trouble getting the 'OK' from the FCC. The FCC approval papers date back to September, suggesting it was something else that caused the delay. The HomePod is differentiated largely by its emphasis on sound quality (in addition to its Siri powers) and features Apple’s custom A8 ARM-based silicon to give it some genuine on-board smarts. 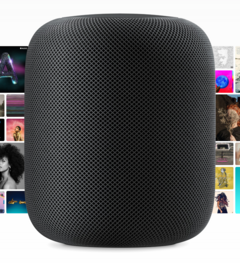 Featuring a high-excursion woofer with a 20mm diaphragm, seven-tweeter array and a six-microphone array, the HomePod uses an algorithm that continuously analyzes the music and then dynamically tunes the speaker output in response. Priced at a steep $349, it will want to sound amazing for a tiny 6-inch tall device. Expect it next month, or March at the very latest if it is to meet Apple’s launching “early 2018” promise.